The Propaganda is in the mail. This past week I went to my mailbox in the social sciences divisional office and was surprised to find every faculty mailbox had been stuffed to overflowing with a 2014 calendar of the Shen Yun dance troupe. It would be treating the “calendars” with too much respect to call them junk mail—much more respect than was shown to our faculty by the person who dumped them there—despite our administrative assistant’s warning that most would end up in the trash. We got spammed by representatives of Falun Gong. Hit by the actual world version of cheap mortgage deals, Viagra supplements and mail order bride messages that circulate online—hawking a similar kind of cheap fantasy to the financial deal, the potent erection and the happily-ever-after-love-in-the mail. 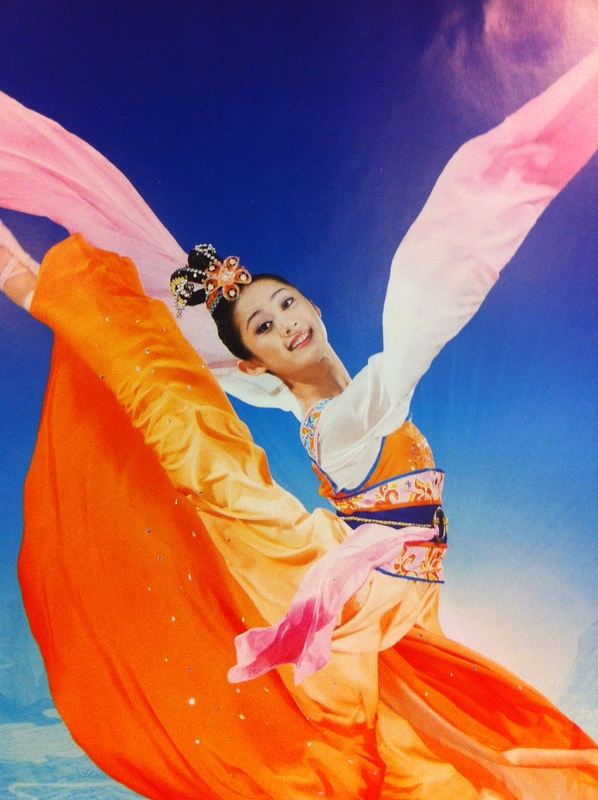 As a professor who teaches about China, I have a strong, visceral reaction to the images of the Shen Yun Dance group’s propaganda. I work hard to disabuse my undergraduate students of their stereotypes of Asia and introduce them to contemporary issues, relationships and controversies that link their lives in the US to those in China and other places around the globe. The mail-spam also upset me because at least one of my colleagues assumed that I had stuffed the faculty mailboxes. After all, he told me, I direct the East Asian Studies program at our university. It is the kind of presentation of a “traditional China” that gives the viewer exactly what he or she wants—the performance of an exotic that is easy to consume and resonates with upper class ideas of “high culture.” Dance. Beauty. Culture. A global village performance. When considering the aesthetic desires evoked by “swords and silk”—a world of idealized serene faces and flawless features, at first I was inclined to compare Shen Yun to the socialist realist propaganda images of the Chinese communist period. There are certainly formal aesthetic similarities and Shen Yun’s backers—Falun Gong—certainly use propaganda methods and organizing tactics that find roots in revolutionary China. That comparison, however, didn’t seem quite right because the images of socialist-realist revolutionary propaganda intended their idealized images to cut a sharp contrast with the less-than-ideal present—a difference which made the future worth struggling for. In this sense, it seems to me, revolutionary propaganda posters were about something different—a political message wrapped in a progressive aesthetic. 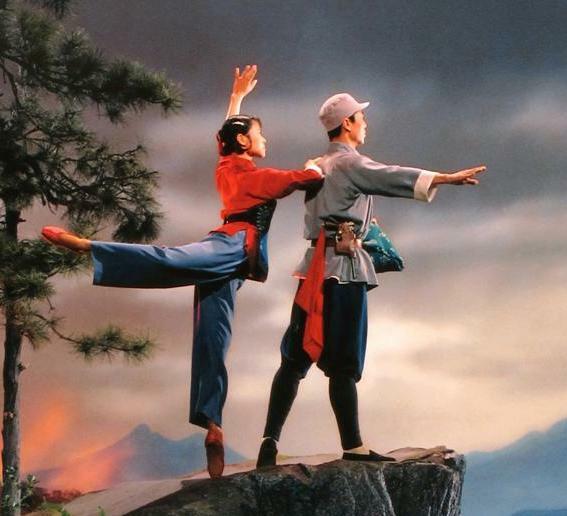 The “swords and silk” imagery of Shen Yun seems different to me—it “does” something different. It offers images of an otherworld past unrelated to the present except as entertaining escape. Shen Yun’s ideology is a conservative one—reinscribing conservative gender roles, Confucian hierarchy, and an Orientalist aesthetic. An uninformed visitor to their performance might mistakenly think that the pageantry actually has some relationship to contemporary China. Perhaps it does, if only as the propaganda and fundraising operation of Falun Gong. This, however, would be confusing content with form. I’m interested in the rhetoric, representation and claims of a “swords and silk” show to “revive culture.” What is the definition of culture that is being evoked here? How does an Orientalist pageantry performed for a largely non-Chinese audience “revive” anything? How does one attend to the often creepy evangelical tones of their advertising and propaganda videos? A more useful comparison might be to think of the Shen Yun troupe in the context of Buffalo Bill Cody’s Wild West Shows of the late 19th Century US. 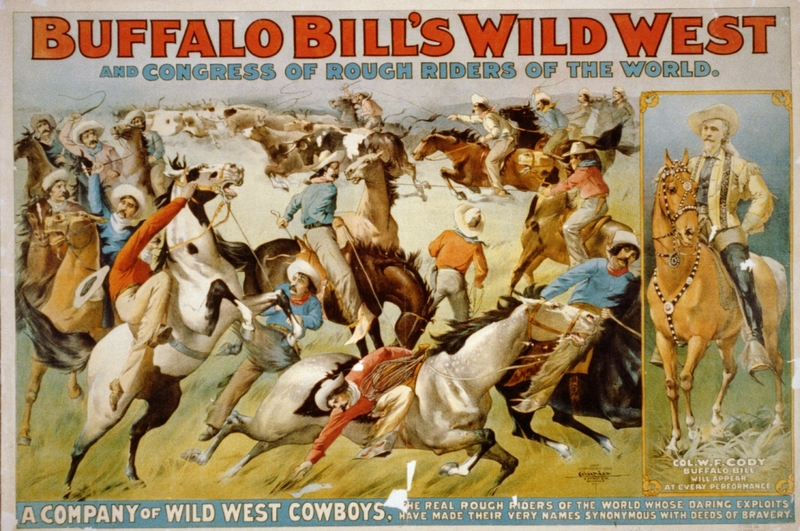 At exactly the moment the West was closing and the cowboys disappearing, Cody’s shows represented an “American Wild West.” It represented “Cowboys and Indians” to Americans as well as Europeans—an exhibitionary spectacle which performed difference at the moment it was being erased—offering a uniquely American subjectivity which could be circulated at an earlier stage of globalization. The “Indians” were part of the show even as US government policy focused on strong assimilationist policies. It be useful to think about Shen Yun as a kind of “Wild East Show”—a visual spectacular intent on circulating a mythology about “reviving a 5,000 year civilization” in terms that appeal to hapless consumers and enriching the owners. It is a mythology asserting an “exotic” that confounds and distracts from the much more important relationships that lie beneath. 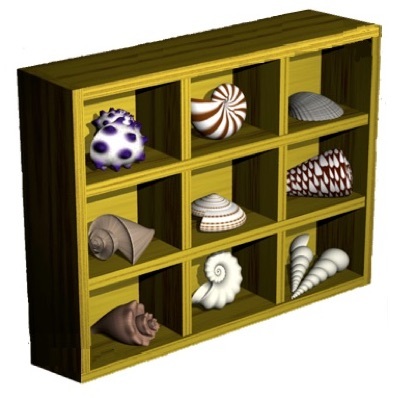 Due to the holidays this post didn’t actually go live until Sunday, January 12, 2014. At the same time I posted it, I also shared the link on my Twitter account. Since I was writing about Shen Yun, I thought I’d also address them on the tweet @ShenYun. No secrets here. Clearly it attracted attention and hits on this post spiked pretty high—all for a pretty off-the-cuff reflection. Last night I also got a tweet from someone, no doubt affiliated with Falun Gong, who directed me to read some of their important materials. I thought I’d include the tweets here with the original post. I wish they had left comments directly on this blog, however, so we could have a discussion. Like I said, no secrets here. Interestingly, the arrival of the links and the directives mirrors the kind of propaganda style of the revolutionary CCP that I mentioned in the post above. Jone tells me “something I should know”—an exercise in thought rectification through the spread of a text that I should study. For anyone who has worked in Mainland China and had an expereince with that unnerving feeling of getting an unsolicited message from an unseen watcher, the post from “Jone” was also familiar in another way. The cult part of the “5000 years” of Chinese culture has always made me uncomfortable. On February 19th, after posting both this blog post and this one, I received an email from a person named, “John” who asked that I take my post(s) down. I’m just going to leave it here without any editorial comment by me. I responded to John with an invitation to make comments at the end of the posts, which I promised him I would approve and engage. In the beginning, I though it is a review, but the more I read it, the more I feel it is like a propaganda for the CCP. It is just a beautiful show in the US, a true freedom land. Especially the war picture used in this article, you don’t know what is that for, it just like the Chinese pianist performed a widely-known anti-American propaganda song at the White House, and make a fool of some of our US people who don’t know the origin of the song. I am quite confused by your comment. Perhaps you are reading in your second language, so you don’t quite understand my argument. Propaganda for the CCP? What are you talking about? War picture? Telling me what I don’t know? Please, read more carefully and respond to what is written and not what *you think* is there. I approved this comment because I believe in open discussion. You do not, however, get to make things up. I couldn’t agree more! Not only is it a Wild East Show, it is a poorly put together perfomance. If we are talking on a performance level of Cirque du Soleil then I have the feeling merely mentioning Shen Yun in the same sentence is an insult to these great artists. I have been there myself and know how they handle stuff. The performances they claim to be original are just copies from some dance competitions in Mainland China (I am referring to one of the dances Shen Yun calls mongolian dance, which seems remarkably similar to dances that were made earlier.) So far for ‘authenticity’. The reason why Alex assumes you are making propaganda for the Communist Chinese Party is because everything that doesn’t agree with what Falun gong or rather Li Hongzhi utters, is considered to be CCP propaganda. Which in my opinion is quite a limited view of the world. I’ll wager the Shen Yun media campaign for the Minneapolis-St. Paul area was similar to what I’ve observed both here (Seattle) and during a week-long visit to San Francisco a month ago. The tour seems to have a print, TV and online media budget greater than anything I can recall. And it’s among the least creative / most annoying ad strategies I’ve observed. Washington State’s not one of the key places for this year’s presidential primaries (yea! ), so I’m at least fortunate we’re not wrangling with that type of crappola.